“Blind Willie” Johnson, known as the “Sightless Visionary” and bluesman and virtuoso of the "bottleneck" or slide guitar, was born near Brenham, Texas, on January 22, 1897 (according to his death certificate). He was the son of Willie and Mary (Fields) Johnson. The family moved to Marlin when he was a small child. Reportedly his mother died, and his father remarried. According to one legend, young Johnson was blinded when his stepmother threw lye at his father and some of it got in Willie’s eyes. Johnson had aspirations to be a preacher. His father made for him a cigar box guitar, and he taught himself to play. He performed at Baptist Association meetings and churches around Marlin and nearby Hearne, Texas. At some point Johnson moved to Dallas. He may have married Willie B. Harris, though no marriage certificate has been found. They had one daughter. Willie B. Harris sang accompaniment with Johnson on some of his recordings for Columbia Records between 1927 and 1930. A second woman, Angeline (listed as Anna in the 1920 census), sister of blues guitarist L. C. “Good Rockin’” Robinson, claimed to have married Johnson in 1927. According to Johnson’s daughter, her father lived with the family in Marlin, Texas, until the late 1930s. Eventually he settled in Beaumont. Blind Willie made his professional debut as a gospel artist. It total, he made thirty recordings for Columbia during four sessions. He was known to his followers as a performer "capable of making religious songs sound like the blues" and of endowing his secular songs with "religious feeling." 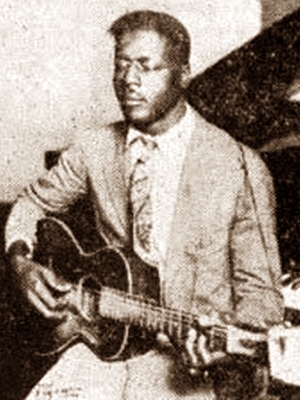 Johnson's unique voice and his original compositions influenced musicians throughout the South, especially Texas bluesmen. He sang in a "rasping false bass," and played bottleneck guitar with "uncanny left handed strength, accuracy and agility." So forceful was his voice that legend has it he was once arrested for inciting a riot simply by standing in front of the New Orleans Customs House singing If I Had My Way I'd Tear This Building Down, a chant-and-response number that stimulated great audience enthusiasm. Johnson's celebrity career ended with the Great Depression, after which he continued to perform as a street singer but did no further recording. A 1944 Beaumont city directory listed him as operating the House of Prayer in that city. He died in Beaumont on September 18, 1945, and was buried in Blanchette Cemetery in that city. Anna Johnson was listed as his widow in a 1947 Beaumont directory. Johnson left behind a legacy of musical masterpieces, some of which have been rerecorded on Yazoo Records. His work includes such classics as Nobody's Fault but Mine, God Don't Never Change, Mother's Children Have a Hard Time, Bye and Bye I'm Going to See the King, God Moves on the Water, Jesus Make Up My Dying Bed, and I Know His Blood Can Make Me Whole. Note: This is a cenotaph. Although Willie Johnson is known to be buried in this cemetery, the exact location has been lost over time due to poor record keeping.